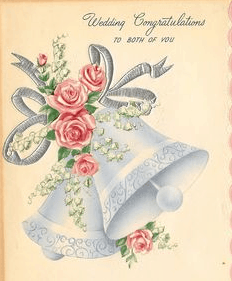 You’re on religious wedding greetings, page 5 of 7 Wedding Wishes and Quotes. See menu at bottom of page. Religious wedding messages let the soon-to-be wed couple or newlyweds know that you’re thinking of them and asking for God’s blessings for their marriage. Review the list below and perhaps you’ll be inspired to write a religious wedding wish of your own. God bless you on the special day. Keeping you in our thoughts and prayers. May God bless the two of you on your journey! May you always walk together in happy ways of love, while trusting in the grace of God to lead you from above. As God decreed, we agreed. May God bless and carry you through a lifetime of blessings and happiness. May God bless this wedding and your marriage. What God has joined, let us celebrate! From God’s love all love flows. Congratulations Newlyweds! Being a family means that you will love and be loved the rest of your lives. God’s timing is always right. Congratulations. May God shower your new lives together with many blessings. May you continue to walk with God together. Wishing you all the best as you begin your new lives together. God has so many more wonderful things planned for your future together. May God’s love be the bond that holds your marriage together.